In partnership with long-time friend Roger Martin, Dean of the University of Toronto’s Rotman School of Management, A.G. (Alan George) Lafley, 65, advances his best thinking on a subject both familiar and misunderstood by business leaders. In Playing to Win: How Strategy Really Works, the former CEO of Procter & Gamble and 2006 Chief Executive of the Year, argues that too many firms confuse strategy with having a vision or plan, when it should be about identifying choices for how to win. Further, Lafley and Martin say attention to strategy is more crucial now that many built-in advantages for American competitiveness have largely dissipated. Under Lafley’s leadership P&G’s sales doubled, profits quadrupled and its market value increased by more than $100 billion. In addition, its portfolio of billion-dollar brands, such as Tide, Pampers, Olay and Gillette, grew from 10 to 24 as a result of the strategic choices he and his team made. 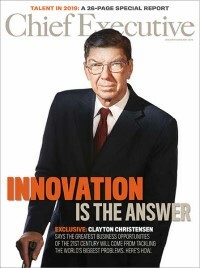 Not that everything he touched turned to gold—in his previous book, The Game Changer, which he co-authored with Ram Charan, Lafley cited no fewer than 11 innovation “failures,” which ranged from Fit Fruit and Vegetable Wash to a Vidal Sassoon Hair Care product that flopped due to inadequate consumer testing. A special advisor at Clayton, Dubilier & Rice, a private equity partnership, and director at General Electric and Legendary Pictures, Lafley draws on his rich experience as well as the ideas of Warren Buffett, Michael Porter, and even Wolfgang Puck in demystifying his subject. Recently he spoke with Chief Executive in New York. Larry Bossidy made a great impact in management thinking with his book Execution. Some argue that strategy is all well and good; but unless you execute, you’re nowhere. Bossidy’s is a great book. The part where we’re in violent agreement is [that] the only strategy the market, your customers [and] your competitors ever see is what you execute. But we say explicitly in the first chapter of the book that, without choices, any execution won’t do in the sense that it won’t deliver as consistent, as reliable and as sustainable performance and results. So, yes, in the end, nothing happens until execution. But strategy guides and enables execution. Strategy allocates capital and it allocates people. You make choices about where to play, how to win, what your core capabilities will be and how you’re going to manage and measure these. Strategy is conceptually simple. It’s about positioning your company, your product line or service offering preferentially with customers. It’s about gaining competitive advantage. It’s about creating value. Bossidy talks about some of the hows and those get into how you connect it to your operating plan. We talk about strategy deployment through an OGSM: objectives, goals, strategies and measures [approach]. Larry talks about putting your talent against your strategic choices. So, I would argue we’re not that far off. Who should be doing strategy? The CEO? The CEO with the team? The CEO with the board? The strategy consultants? At the company level, the buck stops with the CEO; and increasingly, the buck stops with the CEO and his or her board because beyond governance, risk management and succession, it’s the fourth major responsibility of the board. For example, who’s at fault at JCPenney? Are you going to lay it all off on the CEO, Ron Johnson, or does the board own some of this because, for whatever reason, they didn’t take the time to think through critical elements of strategy? The CEO and his or her team may selectively use outside resources, but they need to be brought in to do very specific things. For example, analysis of an industry that you’re contemplating entering will be useful—but only because it’s not your core businesses. You never want to delegate the choice making, the decision making and the strategy to the consultants. That’s a huge mistake.